New app, new look interface. As I mentioned in my last posting, I have been talking to a number of ARev users who have been using their systems for decades and have resisted the move to a Windows GUI interface. The reasons are numerous and wide reaching, but the main reasons are the cost of conversion, the leap of faith and loss of productivity. The introduction of ARev32 has helped with the first two concerns and the guys at Sprezzatura have proved several times that good application design and some clever UI tricks can have your data entry operatives working just as fast in a Windows GUI interface as your procedural DOS ARev interface. However, I hit a new one a few weeks back. The user that I was talking to likes the clean (lack of buttons and other graphics) procedural nature of their interface. We’ll OI can help with the procedure, that is just good UI design and use of the tab order. But what about those buttons that our interfaces are often littered with. manager for my local archery club. The application needed to be thrown together super quickly, so OpenInsight was the only choice, or am I just a little biased ;). However, I remembered that a fair amount of time was taken creating button images, saving those as entities in OI, etc.So, another method was needed and it came to me whilst browsing some old OI files. In short, I decided to only have high level buttons on the MDI Frame that will launch the main windows, run QBF, etc. The pop-up buttons and other in-form functionality buttons were all done away with and the labels marked blue and made clickable. In my opinion, the result is a much less cluttered interface. 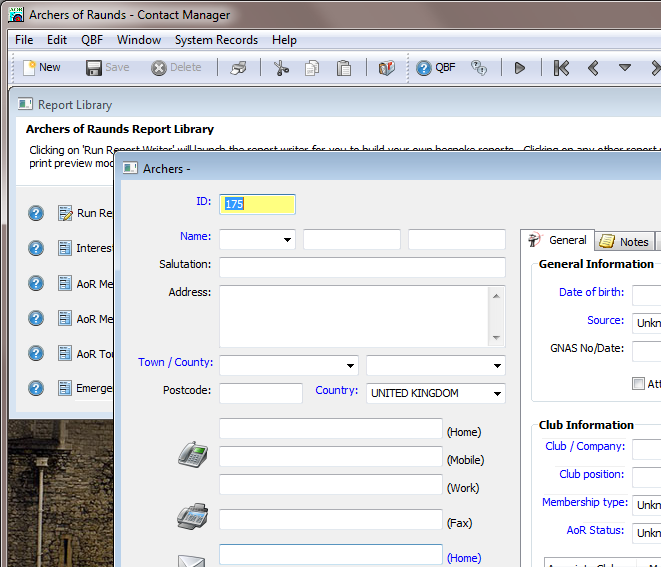 Better still, I was able to create the database files and screens to manage my archers (and other contacts) personal records, capture the details of other clubs (and other organisations) to link archers to, capture who has what trophy and when it is returned to the club, my communications linked to clubs and archers. I then also created the DB Maintenance screens for lookup windows and dropped in the email blast module from my Revelation contact manager. Finally, an evening working with the new Banded Report Writer resulted in a single clean window which currently houses 6 reports and this number is growing. So what about the time to complete the project? Well, I still have some reports to build and I’d like a hotlist window to track my tasks, but the application was up and running within one week of evenings (less than 24 hours work). Give me a call if you would like a closer look at how this effect was created. With an increased and growing interest in OpenInsight application development, I am pleased to announce that RevSoft UK are now in a position to offer the Introduction to OpenInsight training course at a budget price. This will provide anyone new to OpenInsight with an opportunity to gain some valuable product and application development knowledge usually within the tight training budgets that that many people are having to maintain at the moment. Unlike our premium offering which is presented by a highly experienced OpenInsight application developer who can go off topic and get application specific, this budget level training course will closely following the published Introduction to OpenInsight course agenda in a classroom style setting. Of course, our usual premium level training workshops are still available for those of you with specific requirements and who wish to undertake training within the context of your specific application or proposed project. Please drop me a line if you are interested in registering your interest for the next Introduction to OpenInsight training course to be held in Ealing, London in a few weeks’ time.